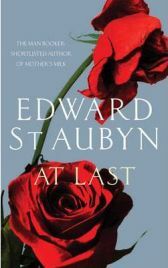 At Last is the fifth novel by Edward St.Aubyn to deal with the life of Patrick Penrose. The first three books in the sequence (Never Mind, Bad News, Some Hope) were written in the 1990’s and there was then a gap to 2006 when Mother’s Milk was shortlisted for the Booker Prize. At Last is set on the day of the funeral of Eleanor Penrose, Patrick’s mother. It is perfectly possible to read At Last without having read any of the previous books – it stands alone as a novel – although in all likelihood a reader’s enjoyment would be increased by familiarity with the earlier novels. At Last deals almost exclusively with a socially, financially and intellectually gifted group of characters. For instance, we meet Erasmus, a philosopher, whose thoughts, concerns and conversation are almost entirely focussed on the meaning of consciousness, and Johnny, a psychoanalyst and former drug addict. For other characters (such as Nicholas), what matters is not intellectual excellence but the world of wealth and social privilege. While this relentless focus on ideas and higher society requires concentration on the part of a reader (and at times some thought, or rereading of a passage), At Last is also very funny in places. There are some excellent anecdotes, and Nicholas in particular is very amusing (although I have no doubt he would be horrible to meet in real life). At the core of the book is Patrick himself, dealing with the death of his mother (a rite of passage), reflecting on his past and looking forward to how he may wish to live in the future. It is made clear that Patrick has had an extraordinarily difficult life – sexually and physically abused as a child, subsequently an addict in adult life. Much of this echoes the personal history of the author as well documented elsewhere. However, at the end of this book a positive note is struck and there is a sense that Patrick to an extent has come to terms with his childhood following the death of his mother, and that he can look forward with at least a little optimism to the future. This is an elegantly written book, from a highly intelligent and gifted writer. He writes from the perspective of privilege, but also from a perspective of damage. The writing places demands on a reader, and for some the demands will be too much – this is a book to be read slowly and savoured. Some of the characters seem mannered and unrealistic (for instance, it is hard to remember that Patrick’s sons are so young when we read their conversations). However, there are many thought-provoking elements along with some very entertaining passages. Lovers of literary fiction should enjoy it, though for readers who like plenty of action it is likely to have less appeal. With thanks to Picador for providing a review copy. No Comments on "At Last"